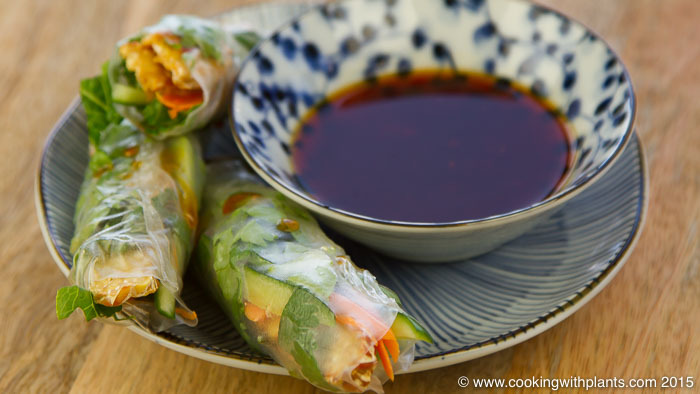 Today I show you the easy way to make vegan rice paper spring rolls with a super tasty Asian dipping sauce! This is a healthy gluten free recipe that anyone can make in just minutes. The sauce can be used as a salad dressing as well and uses just 3 simple ingredients. Quick, easy, healthy and delicious… enjoy! Run a tea towel under water and wring it out. Fold in half and place on a bench or chopping board. Use this to roll your rice paper rolls on without sticking. Get a large bowl, plate or quiche dish and fill with some like warm water. This needs to be large enough to dip the rice paper into. Take a rice paper sheet and drag it through the lukewarm water for a couple of seconds. It will still feel firm but it will continue to soften as you fill it. (See video demo at top of this page for full visual instructions). Place the rice paper flat on the damp tea towel and place some lettuce into the top third of the rice paper. Add cucumber sticks, carrot, tempeh and cilantro. Do not overfill. Fold top edge down, fold side edge in and roll up. Set aside on a plate or non-stick parchment paper until ready to eat. You can also store these in the fridge to eat later or the next day (will keep well for about 3 days). For the dipping sauce, combine all ingredients in a small bowl and stir together until well combined. Dip your spring rolls in the sauce and enjoy! This sounds wonderful. Can’t wait to try it. Thanks. Have been Vegetarian for 45 years and went Vegan three years ago! Your site and your delivery is second to none. Bravo! Awesome recipe and it is so easy! Thank you Anja for sharing with all of us this simple and yet nutritious recipe.. Fantastic recipe, Anja. We just finished eating it….didn’t want to stop. The cilantro is just perfect in there. Thanks. Fantastic dish. My husband wasn’t a fan of rice papers, but you changed that. We’re having it again tonight. 🙂 Just that good. Thanks again.